I have been on a sliders tear lately. My obsession started with the basic burger and cheese version. Then came my pulled pork slider obsession. 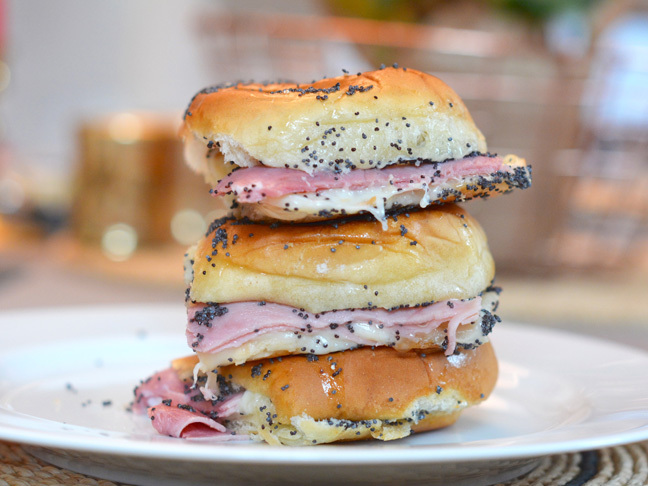 And now, these Hot Ham & Cheese Sliders. They’re easy to make and yes, you can eat an entire plate of them without too much judgement. When I serve a tray warm from the oven they disappear almost immediately. Not surprising, since they’re made with soft white rolls, a ton of Swiss cheese, and an amazing butter spread on top. What’s not to love? Step 2: Nestle the 12 rolls in a baking dish and remove the top of the rolls. Swipe the bottoms of the rolls with the mayonnaise. Then evenly layer the cheese slices across the rolls. They will overlap slightly, but they will cover the rolls entirely. 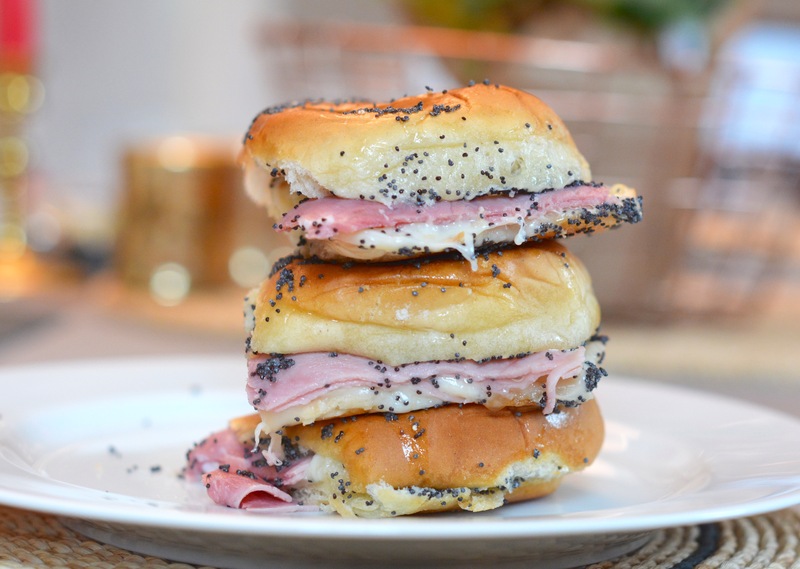 Next, layer the slices of ham across the rolls the same way so they completely cover the cheese. Step 3: In a small bowl whisk the mustard, butter, Worcestershire Sauce, and poppy seeds. Brush this mixture on the tops of the rolls and then place them over the ham and cheese layered bottoms. Step 4: Cover the baking dish with aluminum foil and bake for 15 minutes, or until the cheese is melted. Then remove the foil and bake for 5 more minutes so the tops of the rolls brown slightly. Step 5: Remove from the oven and cut the rolls with a metal spatula or knife. Serve hot.